As an English writing and literature student, I had to deal with the following on a daily basis. “English majors, we just love words! Don’t you just love words? I love words.” Well, no actually. If I cared at all about random sequences of molecular vibrations, I’d have studied music. 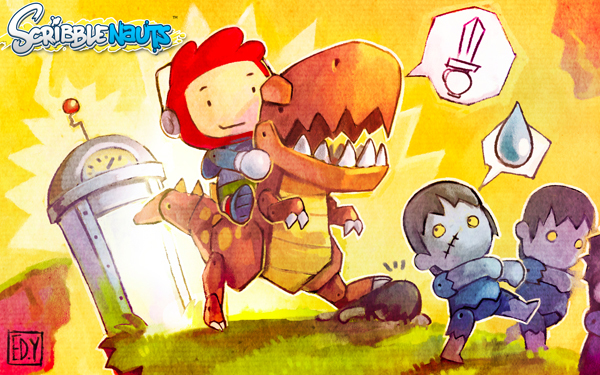 Ideas mean much more to me, and the idea I’d like to discuss here concerns the use of words in Super Scribblenauts. 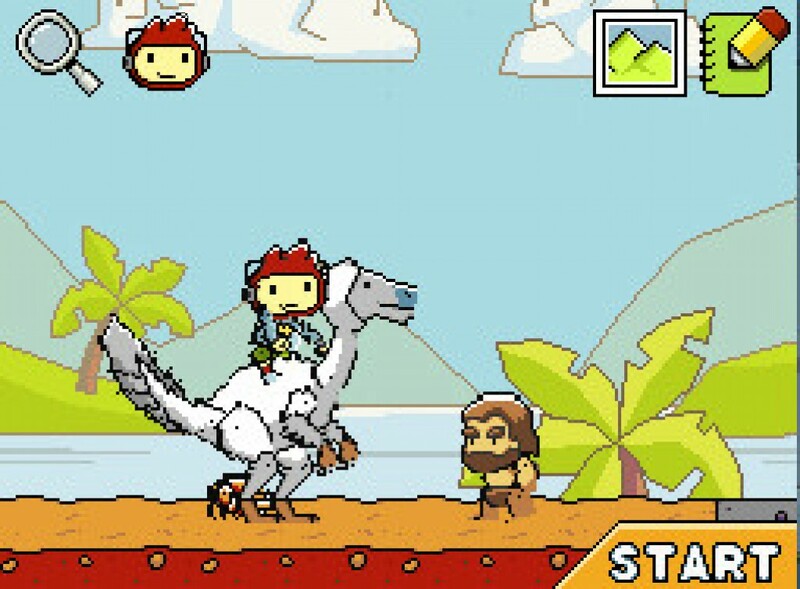 Super Scribblenauts, a game that requires no scribbling or sailing skills and that I can describe as just “pretty good” at best, focuses on solving simple puzzles of varying convoluted-ness by summoning physical objects from an arsenal of anything, literally ANYTHING…that the programmers had the foresight to program into it; just speak (er, type) the word and it shall appear! So long as it doesn’t involve profanity, racism or sexual innuendo. Blood death and violence seem fine, though. I created an “exotic dancer,” once, but since adjectives have about the same effect as labeling your leftovers with a sharpie and hoping that someone will recognize what it means, the game just gave me a ballerina. Sigh…I was really looking forward to the colony on Mars for a brief moment. I have to admire a game that encourages weirdness. Most levels require Maxwell simply to get from point A to point B, navigating certain obstacles such as trees, spikes, lava pits and wedding guest lists. The game encourages the use of new words to solve each puzzle, which keeps it interesting for a while. Eventually, however, the problems become a little convoluted, and I found that using “wings” pretty much got me around any obstacle I needed. I also became quite adept at using a combination of ropes, balloons and a fan to put things exactly where I wanted them. Certain levels require you to think up objects to fill a school or grocery store or something. One level asked me to create a super hero, and to my utter, childish delight, I put in a “cape,” “dead parent” and “bat” and out popped a masked avenger! Your tauntaun will . . . uh, freeze? And as I mentioned in my Phoneix Wright article, creative games usually fail when the player has to tell the game how to think. 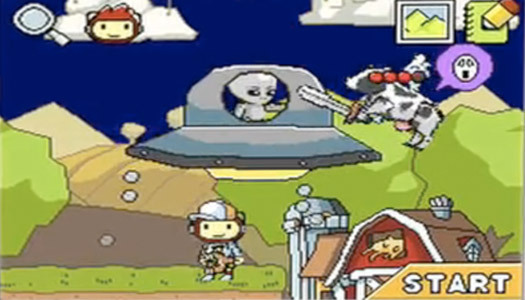 Many of the objects in the game exist, apparently, only for novelty value, as the programmers felt that not everything really needed to function. Maxwell can’t quite figure out that the acid may help more if he took it out of the container. One level asked me to find a safe way for a man to jump off a cliff, so I attached a bungee cord to his waist and a rock and then watched the guy run in circles scratching his head, while waiting for a “ding” that never came. Some puzzles seem to enjoy kicking me in the groin with convoluted answers, but hey, I should have just known that the janitor would clean a mess, but not dirt, the doctor would save someone from a snake, but not cyanide pills, and that a psychiatrist would only check on a patient if they’d seen a big hairy spider. Even if you can summon the object you want, it may not come in a useful form. A few times, I wanted to walk across a pit, so I asked for a plank, only to get something immovably vertical. I could only create fans that pointed left, and ramps that sloped upward to the right. Adjectives don’t reliable alter items either, and while “gold bridge” did in fact summon a bridge made of gold, the system didn’t register any qualities that went with it, so I actually had to destroy it after it started floating away on a light breeze. As puzzle games go, it played rather nicely. The novelty lasted long enough and some problems did require a decent amount of thought. The player has the option to play through most levels on advanced mode, which means they have to solve the puzzle three times without repeating any words. I tried that for a while, but opted against it in the long run, to save my nerves. This entry was posted in Nintendo DS and tagged drawn to life, nds. Bookmark the permalink.